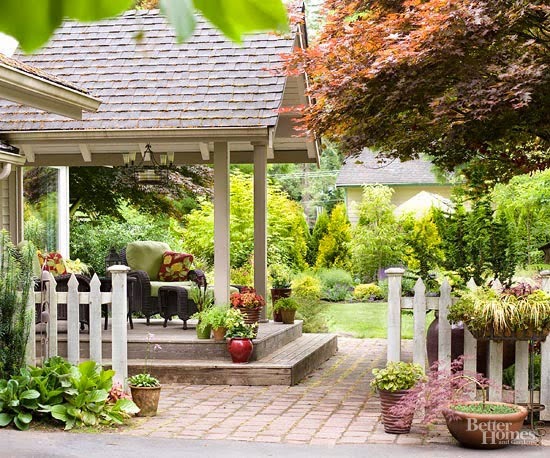 Use simple materials to create a warm and welcoming outdoor room. 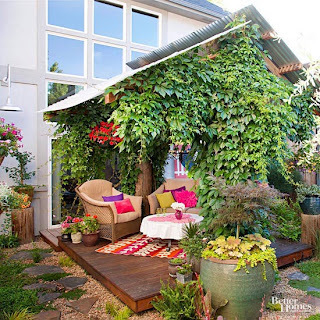 Here, a basic deck is dressed up with wood pillars covered in thick greenery. A corrugated-metal roof provides a modern and distinctive touch. Bright fabrics and flowers add pops of color. Need a relaxing escape? 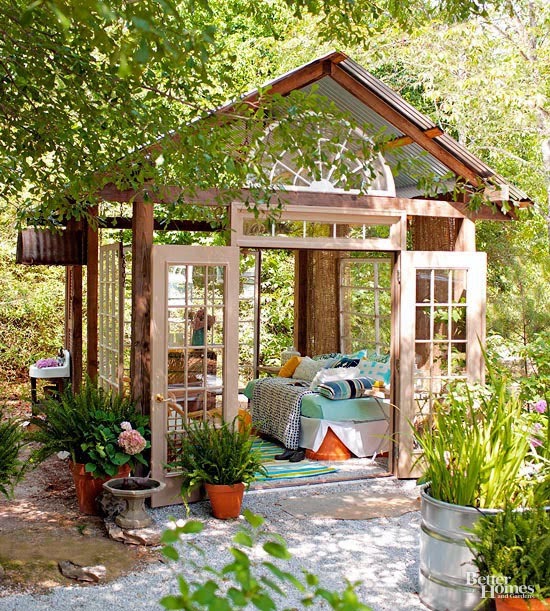 Build one in your own backyard. This outdoor room features French doors, suspended divided-light windows, and a corrugated-metal roof—creating the impression of a fully enclosed space. Inside, a bed offers the perfect spot for an afternoon nap. Give your tired patio furniture a facelift with spray paint. With so many colors and finishes now available for just about every type of surface, your makeovers are limited only by your imagination. Can’t pick just one? 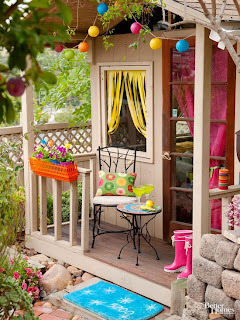 Opt for a variety of colors for a fun and creative effect. 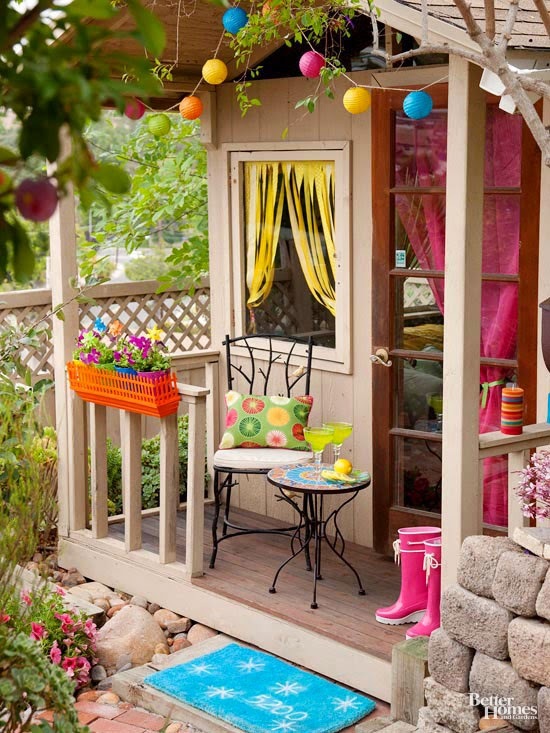 A child’s dream come true, this playhouse features a front porch complete with a bistro table and chair, a flower box, and a string of colorful lights. 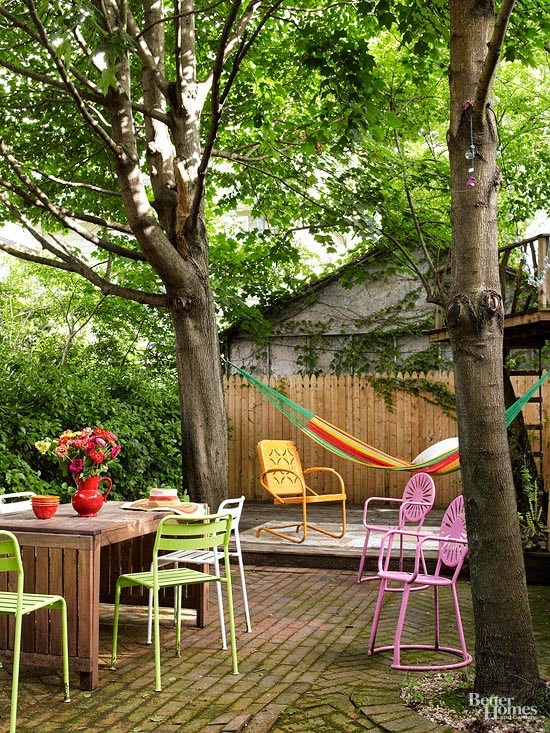 Use all-weather deck material to create an elevated patio. 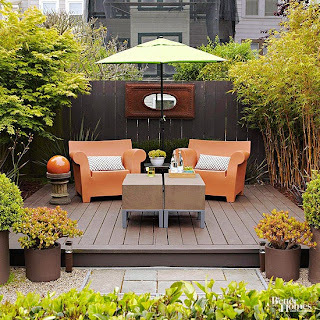 Large containers with lush plantings placed at the corners visually connect the patio to its surroundings. Consider matching the containers to the patio material for a unified look. 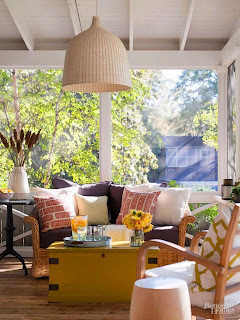 Include a large patio umbrella in your outdoor-room decor. 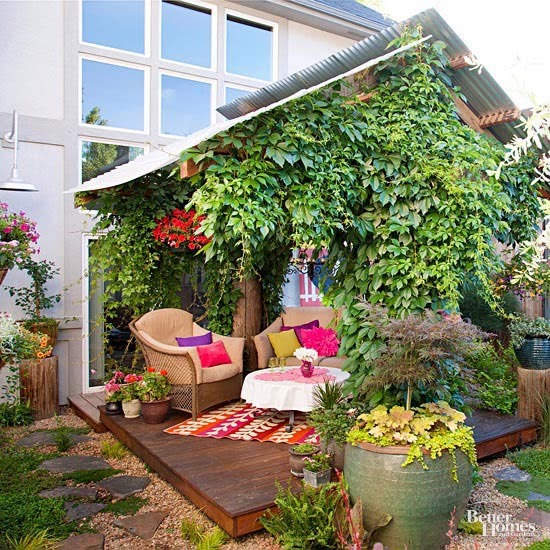 Besides offering much-needed shade to an unprotected patio, it provides a nice vertical element and brings in color overhead. Here, the bold blue of the umbrella and matching chair cushions add the perfect pop of color to the relatively neutral patio. Create an ultracomfortable space by adding the same luxuries you enjoy in your living room. Furniture with plush cushions provides a great place to relax. 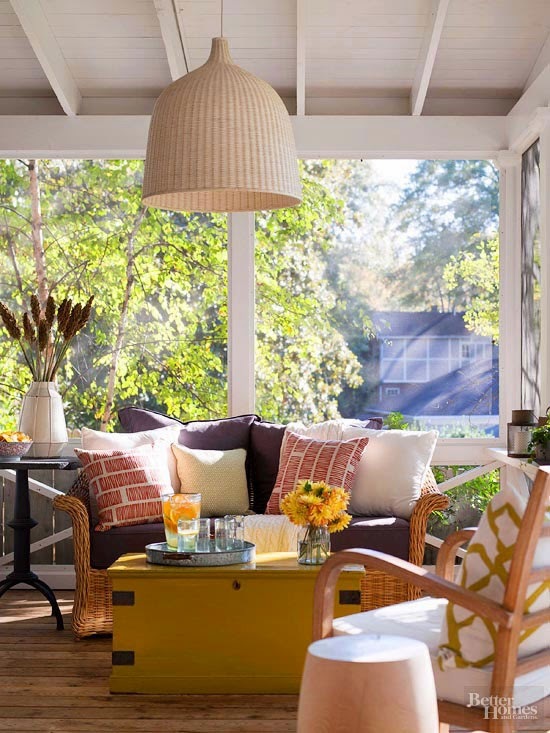 A stylish indoor-outdoor light fixture suspended from the ceiling makes the space usable after dark. Use a colorful and patterned outdoor rug to pull your patio furnishings together. 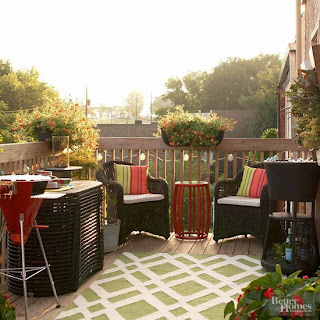 The rug will liven up pavers, brick, or wood flooring; bring your color scheme down to the ground; and create a visual center for your outdoor room. Truly connect your indoor and outdoor living spaces by extending your home’s roofline to create a shady outdoor room. 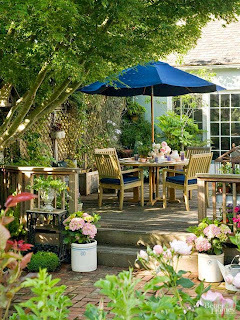 Here, the overstuffed outdoor furniture and chandelier further emphasize the effect.